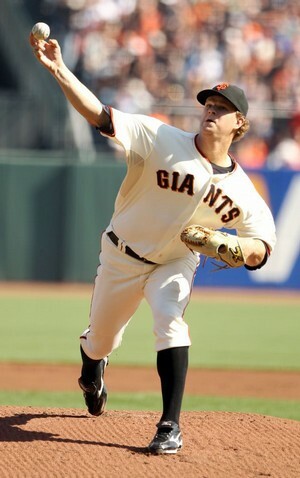 Often lost in the vast shadow cast by Tim Lincecum is Matt Cain. Part of the reason for that is probably because the right hander is four games under .500 for his career (69-73), but don’t let wins and losses fool you. Another reason Cain probably gets taken for granted is because it sometimes seems as if he has been in the league forever. However, despite averaging more than 200 innings over the past six years, Cain is far from a grizzled veteran. In fact, he is actually one year younger than Lincecum. Cain’s mix of youth and experience is both a blessing and a curse from the standpoint of trade value. As a proven commodity entering his prime, the right hander is sure to have many suitors, however, because he is only one season away from free agency, many others will be scared off by the pending mega-contract he’ll likely receive. For the latter reason, the Giants would probably be better off trying to sign Cain to extension, but if they determine his price is beyond their means, a trade would become inevitable. Because of his youth and durability, not to mention impressive peripherals, Cain should be a prime target for the Yankees. However, there are risks. For starters, how much of Cain’s success has been predicated upon pitching in a big ballpark against weaker teams from the NL West? According to his career splits, those concerns are probably exaggerated. Not only is his road ERA a still impressive 3.62, but some of his best success has come outside the division. Still, Cain’s 44.2% fly ball rate, which ranks fourth highest since he entered the league in 2005, is something to think about when you consider half of his starts will likely come against lefty-leaning lineups at Yankee Stadium. If the Giants decide to trade Cain, they might be more apt to pursue major league talent, particularly on offense, than minor league prospects. Depending on what tact Brian Sabean decides to take, the Yankees could either offer a package around an offensive player like Brett Gardner or a pitching phenom like Dellin Betances and Manny Banuelos. The former would give the Giants a gold glove caliber CF (and allow newly acquired Melky Cabrera to shift over to right), which is particularly valuable at AT&T Park, whom they could insert into the lead off slot, while the latter would help the organization replace the pitching depth they forfeited in the Carlos Beltran deal. Either way, the two teams seem to be a good match if there is a deal to be made. 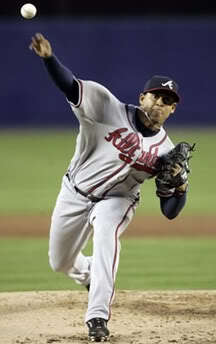 Jair Jurrjens is another young right hander (2012 will be his age-26 season) who seems more like a veteran. With four full seasons already under his belt, Jurrjens has compiled considerable major league experience. However, unlike Cain, durability has been somewhat of a concern. Injuries have limited the Braves’ right hander to less than 270 combined innings over the past two seasons, so any team acquiring him would have to be convinced there aren’t any time bombs hidden in his medical reports. Trading a promising pitcher like Jurrjens doesn’t seem to fit the Braves’ MO, which itself is reason to give a potential suitor pause, but according to published accounts, Atlanta could be looking for salary relief in addition to that received in the Derek Lowe trade. If money is the issue, and it should be noted Jurrjens stands to get a sizeable raise in arbitration, then the Yankees are in the perfect position to capitalize. Because the Braves already have a bevy of young pitching prospects in the minors (another reason they may be open to dealing Jurrjens), the Yankees will have no choice but to dangle position player prospects or major league ready offensive players. Unfortunately, what the Yankees have an abundance of (catchers), the Braves don’t particularly need, unless there are plans afoot to move Brian McCann out from behind the plate. The Braves could use help on the right side of the infield, but unless GM Frank Wren is a fan of Eduardo Nunez, that’s one area in which the Yankees have little to offer. Because making a match with the Atlanta could be a challenge, Cashman would likely have to involve a third team (just as occurred in the Curtis Granderson trade) to make the deal work. If, after exhausting all efforts to obtain the five pitchers identified as headlining (what should be) the Yankees’ wish list, Brian Cashman still finds himself without a handshake, perhaps he could turn to the Dodgers for a distressed asset (and I don’t mean the team itself). After quickly developing during his first three seasons in the majors, Chad Billingsley looked poised to emerge as one of the best pitchers in the game. Instead, he regressed significantly, essentially becoming a league-average starter over his last three years and leaving the Dodgers to wonder what he will provide going forward. In some ways, Billingsley is to the Dodgers what Phil Hughes is to the Yankees. Both right handers were highly touted, had early success, and have since become enigmas. In that light, it’s hard to see the Yankees wanting to take on another question mark in the rotation, especially one that comes with a $10 million price tag over the next three seasons. That contract, however, is what makes Billingsley an intriguing target. With the Dodgers mired in bankruptcy, and Frank McCourt finally agreeing to sell the team, there’s no telling what mandate will be given to GM Ned Colletti. If the Dodgers decide to cut payroll, Billingsley might be the first place they start. Although he would be a high risk acquisition in terms of projecting future performance, the cost should also be relatively lower. Would Austin Romine alone be enough? Maybe a sweetener would also be needed (Eduardo Nunez perhaps)? That depends on the Dodgers’ desperation, and the degree to which Billingsley has fallen in their estimation, but when you look at the catchers currently on the Los Angeles’ roster, it’s not hard to see why Romine would be appealing. Along with the myriad of free agent options, Brian Cashman will have his hands full sorting through the trade market. Whether it’s Hernandez, Gonzalez, Danks, the three right handers mentioned above, or one of the many free agents, the Yankees should be able to fill the holes that currently exist in the rotation. Patience was the theme last off season, when the options were few, but in the current market, prolonged inaction will quickly make it wear thin. It’s time for Brian Cashman to start making his wish list (or the one presented to him here) a reality.